ForgetMeNot-Beautiful Townhouse - Com vista para o mar e praia privada. 2 quartos, 2 banheiros mais sala de pó, com vista para o oceano com praia privada. ForgetMeNot villa, uma bela moradia de dois quartos e meio de casa de banho, é a casa perfeita longe de casa. É recém-construído, acabado com um alto padrão com balcões de granito, pisos de porcelana e cozinha totalmente equipada. Estamos localizados no Little Bay Country Club em Negril, Jamaica, uma comunidade tranquila e fechada com segurança 24 horas. A propriedade repousa no penhasco com vistas deslumbrantes sobre o oceano, acesso 24 horas à praia privada de areia branca, piscina infinita e campo de ténis. (raquetes e bolas fornecidas para seu uso). Veja os magníficos pores do sol no oceano a partir da varanda do seu quarto. A moradia acomoda confortavelmente 2-4 pessoas com cama queen na suíte master e dois gêmeos extra longos no segundo quarto, que podem ser acoplados para formar uma cama king size. A casa está decorada com bom gosto, todas as roupas de cama e toalhas são fornecidas e a sala de estar está equipada com uma televisão de ecrã plano e wifi gratuito, fique ligado se necessário. Uma empregada será providenciada todos os dias e as refeições podem ser facilitadas mediante solicitação. Little Bay fica a pouco mais de uma hora do aeroporto internacional Montego Bay, um passeio fácil na estrada da costa, de táxi ou de condução. As transferências do aeroporto podem ser organizadas se necessário. Relaxe no pátio com uma xícara de café de montanha azul pela manhã ou veja o por do sol abaixo do seu próprio gazebo privado com uma franja vermelha gelada. A praia privada é parte de uma área ambientalmente protegida e você pode ter sorte de ver tartarugas quando eles vêm para ninho ou golfinhos após a soneca da manhã. A água calorosa e convidativa é perfeita para nadar e fazer snorkel, então traga seu equipamento. Não goste de cozinhar, existem muitos restaurantes, hotéis e resorts a uma curta distância. Experimente o Cosmos, apenas a 7 minutos do complexo, ou mantenha-se e faça-os entregar. Pegue o transporte gratuito, oferecido por Ciao, um restaurante de fusão italiano-Jamaica para algo diferente. O mundialmente famoso Ricks Cafe, ótimo para o jantar, entretenimento e mergulho em penhascos, é uma movimentação de 15/20 minutos no extremo oeste. Os muitos bares e restaurantes à beira da estrada estão a uma curta distância da vila, oferecendo cozinha local. Se você quiser uma sensação mais local, faça a viagem até o mercado de artesanato ou o shopping da Time Square duty free para algumas artes locais feitas à mão. A uma curta distância da vila, é a famosa praia de 7 milhas com a sua bela praia de areia branca, esportes aquáticos, bares de praia, restaurantes e entretenimento nocturno, não é um local a perder. A boate de Margaritaville ou Jungle está esperando por você. Se você é um golfista, então o campo de golfe Negril Hills fica a uma curta distância, traga seus clubes ou aluguel no curso. Há muito o que fazer, ver e comer nesta pequena fatia do paraíso, não hesite em nos enviar uma mensagem com quaisquer perguntas ou se você precisar de algumas ideias sobre o que está por aí. Não se esqueça de "Não há problema!" Há um chuveiro ao ar livre para uso quando voltar da praia ou apenas para se refrescar. Use este banho para lavar a areia antes de entrar na casa. Atire em alguns aros na rede de basquete adjacente à quadra de tênis. Gostaria de caminhar, dar um passeio pela comunidade. Você está em um ambiente seguro e você verá caminhantes e corredores diários. Confira a vida local da planta no jardim do clube. We stayed at this lovely villa In February and loved every minute of it. We have stayed in the LBCC development several times before, however, wanted a unit of the cliffs for this trip. The landscaping was impeccable and so well taken care of. The unit was nicely designed and very comfortable. The owner was very prompt in taking care of concerns. Ann Marie, the housekeeper, was so nice and did a great job! Would highly recommend this villa to anyone wanting a serene and relaxing vacation. Thank you for your review Leslie, we are so glad that you enjoyed your stay. We also find the cliffs a special place to be where we can sit and relax above the ocean, with our beach nearby. Our gardener and housekeeper were thrilled to hear your comment about the landscaping and housekeeping. We try to make a difference because we know you have a choice. My wife and 2 adult children and I spent 9 luxurious days in this well-appointed, quiet and comfortable ocean side retreat. What you see in the photos is what you get... although there is absolutely no way to capture the amazing beauty of the 180 degree water view and sensational daily sunsets in a photograph. One of the most important things for my wife and I when traveling is to have a comfortable mattress, and the mattresses in this condo are excellent. Another important thing for us is a responsive host, and the owner, Errol, couldn't have been more helpful. He always responded to messages within a day, and spent about 20 minutes with us on a phone call prior to our departure to give recommendations and advice. Although we didn't use the community pool or beach, they are lovely. The location of the property is perfect because it is just outside the busy part of Negril, but close enough to get to beaches and restaurants in just minutes. We definitely recommend having a car for convenience and cost-effectiveness, but be prepared to deal with some of the craziest drivers in the world! Also be prepared to drive on the left side of the road. The house has everything you need to prepare your own meals, and you will want to because restaurant prices are not cheap! The condo has a large outside deck where you can enjoy your morning coffee, al fresco, or cook your dinner on the gas grill. There is also reliable internet and AC--although we often kept the AC off, opened all the windows for a tremendous cross breeze, and turned on the ceiling fans. Don't hesitate to book this property; you won't be disappointed! Interacting with Art prior to their vacation was a pleasure. It's important to ask as many questions as you can before going on a vacation, even if one has been to Jamaica before and especially if you have not. We are always willing to help, because we really want you to have a good time. So happy to hear that Art thought the mattress's were comfortable. We discussed driving in Jamaica and glad to see that Art handled this well. The drive from Montego Bay to Negril is quite a nice drive along the coast road. Hearing that Art and his family enjoyed their stay is music to our ears and we look forward to hosting them in the future. If you are considering a visit to the Negril area, this oceanfront villa in a quiet, secure, gated community should be near the top of your list as potential accommodations. The villa is part of the so-called "Little Bay Country Club" development (though it's not a golf-related location, so don't let that confuse you) on the north end of Seven Mile Beach. We stayed as a family of five and had plenty of space to spread out. We had a rental car, and you can easily reach any of the Negril-area attractions in 5-15 minutes. (Have a breakfast of Ackee and Saltfish at Sweet Spot, or some great native Jamaican fare at Public House or Pimentoz Jerk - all less than 10 minutes from Little Bay, and all adjacent to 7 Mile Beach... we even went down to the cliffs on the west end and had a drink at Rick's Cafe). The pictures really don't do this property justice - a great "infinity-edge" pool overlooks a private beach, and this particular residence has a small shaded/thatched umrella patio area right out on the waterfront, with amazing sunset views. Anne Marie is extremely helpful in providing suggestions or any needed help during your stay, and the owners are extremely responsive in all communications. The owners provide a well-equipped kitchen, beach towels, tennis rackets and tennis balls, snorkeling gear, etc., so even if you travel light you can still make full use of the Little Bay facilities. It was really nice to go experience the festive atmosphere along Seven Mile Beach but then be able to come home to a quiet and restful spot that otherwise feels like an all-inclusive resort without the crowds. Highly recommended! Thank you Michael and we are so happy that you and your family had a great time at ForgetMeNot villa. I agree that the pictures does not do justice to our villa and we will make an effort to post better photographs. Although a golf course is not part of our community, there is a very nice 18 hole course only a 15 minute drive away. You certainly caught the spirit of ForgetMeNot villa where we provide a private beach, peace and relaxation after the hype of a visit to the beautiful seven mile beach nearby. We certainly look forward to seeing you again. This was a one week stay and a short and sweet review is all that is required to demonstrate enjoyment and satisfaction. Future guests would probably like to see a more descriptive review but our description on the website is really like it is and more. Even though we get 5 star ratings, we will always strive to improve our performance so that it gets better and better for each new guest. This townhouse is a true slice of heaven. 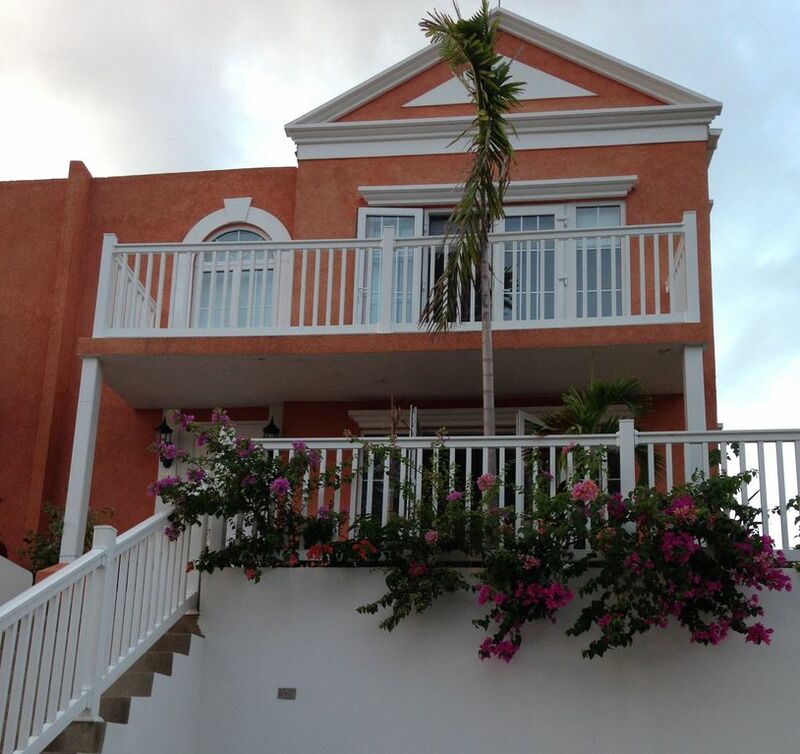 Located in the little bay country club- a gated community in negril. This is an amazing oceanfront unit with incredible views of the water from most of the rooms in the house. When you open your patio door, you have a beautiful deck with ocean views, and then on your own yard you have this private stone deck literally built over the ocean. I would wake up every morning and have a cup of coffee while looking at the waves and waving to the fisherman who are just below. A 2.5 minute walk down to the private beach for the community - one of the nicest beaches I’ve seen. It’s a protected beach and the snorkling is really something. Bring your snorkling gear and fins 100%. Beautiful Infiniti pool, and the grounds are immaculate. The unit itself was beautifully appointed, the owner really has nice taste. It was exceptionally clean, modern and functional. The owner was responsive to my needs and checked up on me several times throughout. I would stay here again in a heartbeat. We are so glad that you and your family enjoyed your stay at our vacation rental. It is really our home away from home and will do whatever we can to make our guests feel that way also. Striving to make to make ForgetMeNot villa a place where we can all go to and feel comfortable and relaxed, is our intent. Rates indicated are for up to 4 people. Additional fees will apply for groups larger than 4 and up to 6.